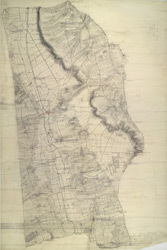 The minimal shading and interlining on this plan conveys the flatness of the land around Brigg. Its complex drainage system is highlighted in blue. Near Market Rasen, "TG" indicates a tollgate.